This photograph shows an exterior view of the rebuilt Stockton Hall at southwest corner of Fourth and Delaware Streets in Leavenworth, Kansas. 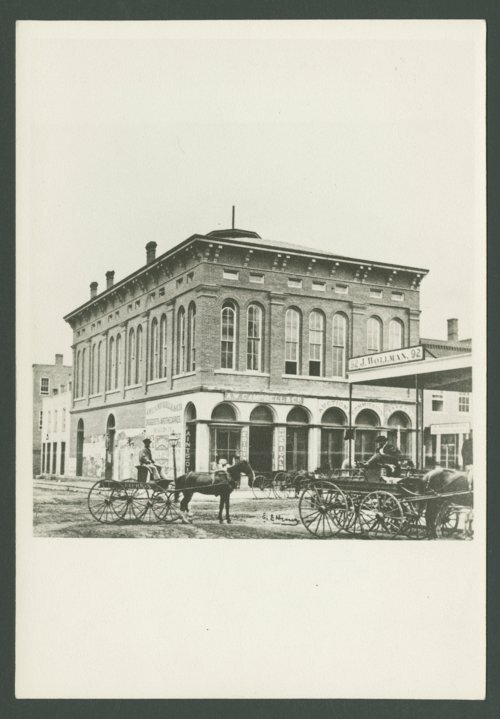 The original two-story brick building, built in 1857 and named after Captain J. B. Stockton, served as a prominent gathering place in the town. In the summer of 1858, citizens of the Kansas Territory gathered in the meeting hall to organize the state's Democratic Party. The following year on December 3, 1859, Abraham Lincoln delivered his famous speech on "Popular Sovereignty" to a standing crowd. The structure burned on January 25, 1864 and plans were soon underway to rebuild. On September 10, 1864, Stockton Hall reopened with Sheridan Knowles' play "The Hunchback". The facility served as a public hall and theater for several years until 1940 when it became the First National Bank building. This structure no longer stands but was replaced with a modern building.